A mother with her children, 1879. Notice the girls’ loose hair and mid-calf skirts. The girls are showing this much leg because they are still young enough to play with rolling hoops. Cartoon from Punch. 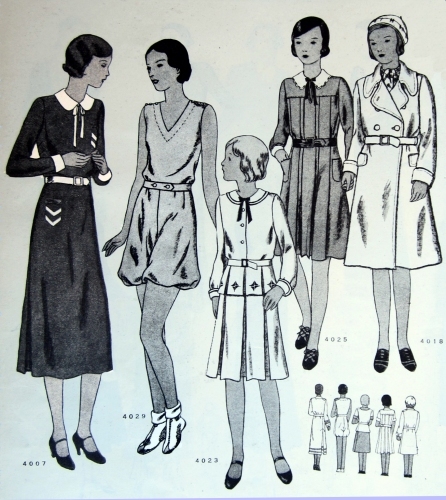 Lynn Mally, of American Age Fashion, recently commented on skirt length as a signifier of age for young women, as seen in this 1930s pattern illustration. Back-to-School Clothes for ages 14 to 20, left, and 8 to 15, center and top right. 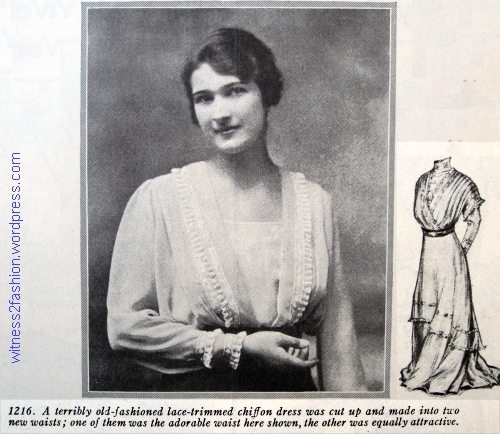 The Delineator, August 1931. 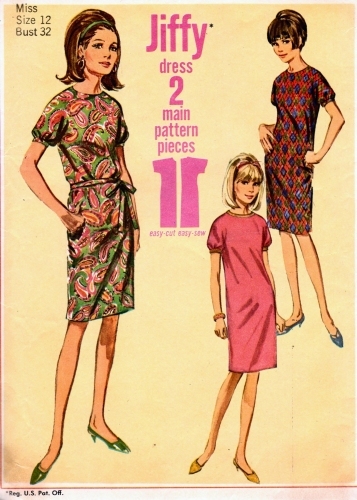 The persistence of fashion: Older people often cling to the fashions — and hem lengths — of their younger days. 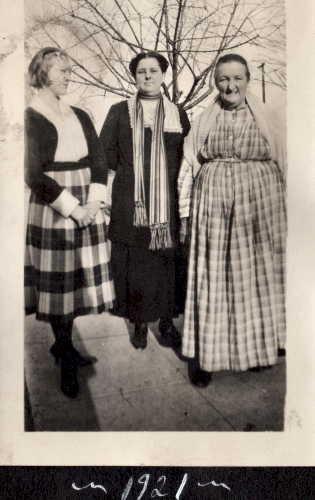 The youngest woman (left) wears the shortest skirt in 1921. September, 1925. 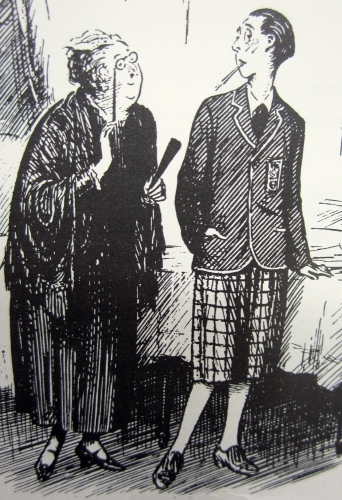 The older woman’s long skirt shows the persistence of pre-war fashion; the younger woman — here being mistaken for a man — has shockingly ‘shingled’ hair. From The Way to Wear’em. Part of the shock of bobbed hair and 1920s fashions was that adult women were showing their legs to men who had grown up in the previous century, when showing the legs was considered indecent. 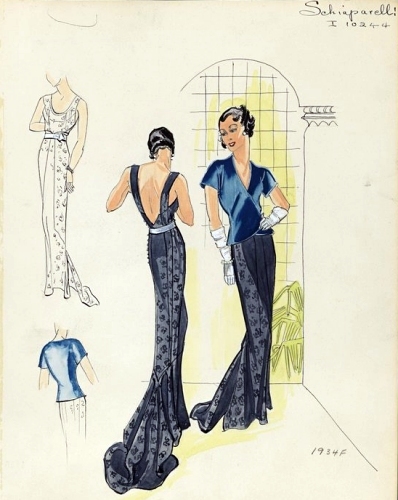 The father of a 1920s’ flapper would certainly have been an adult in the era when married women still wore floor-length fashions, and pinned their long hair up off the neck. It’s not surprising that those men were upset when their wives and daughters bared their legs and cut off their long hair. A male toddler (r) , a girl 10 to 12 (s), and two adult women, 1870. 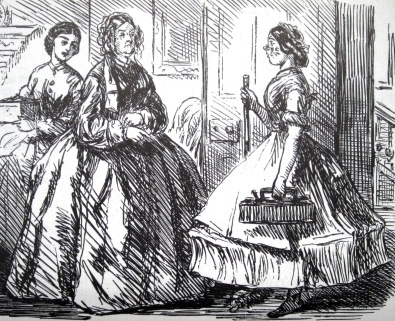 The twelve-year- old girl still wears her hair down, and shows her legs and ankles. 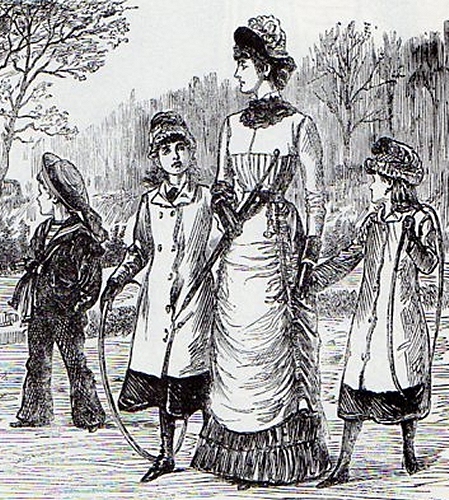 Generally speaking, throughout the 1800s, when a girl reached marriageable age — known as “being out” in society — her availability was signaled by her putting her hair up (as opposed to letting it hang down her back) and wearing skirts that completely covered her ankles, and, in some periods, her feet. 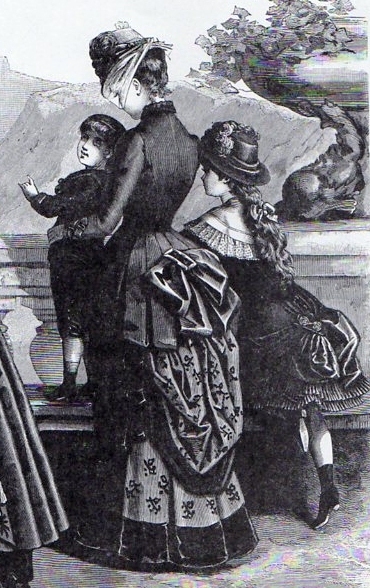 Mother and children, 1884. Mama’s hair is worn up. The girl aged 6 to 8 has hair cascading down her back. Her skirt barely covers her knees. A girl might come out by gradual stages, beginning by sitting at the dinner table with the adults in her family instead of eating in the nursery with younger siblings. Another step was dining with the adults when guests were present (she was not expected to volunteer conversation,) and later, of being included in dinner invitations to other houses. She would not attend balls until she was completely “out;” at that point, she was officially on the marriage market. 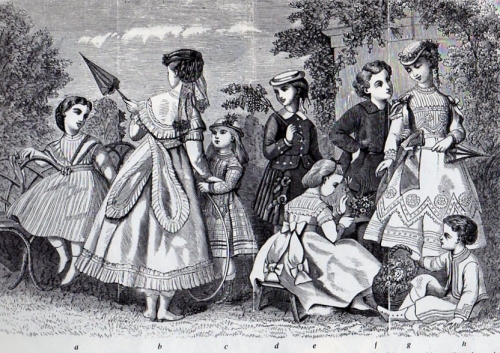 Children, 1868: (a), at left, is a girl about 6, (g), standing right with folded parasol, is 12; (b), left, with the longest skirt, is 14 or under; (e), sitting, is 8. The older the girl, the longer the skirt. There’s an appreciable skirt length difference between ages 12 and 14. 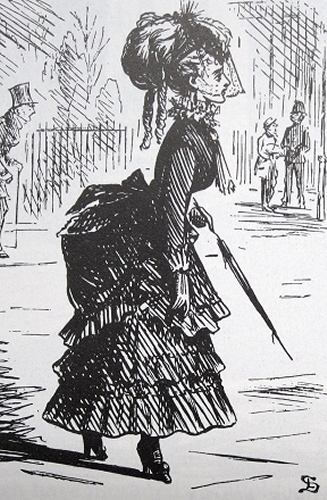 1869 caricature of a lady wearing the popular “Dolly Varden” style. From The Way to Wear’em. The servant is being reprimanded for wearing a hoop. 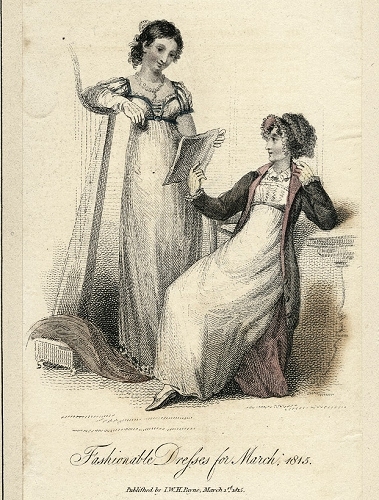 Her skirt is shorter than that of her mistress, who is a lady of leisure. 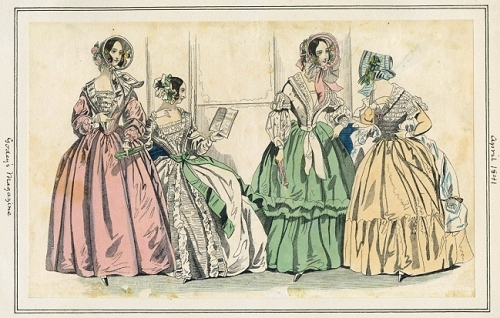 Dated 1863, from The Way to Wear’em. 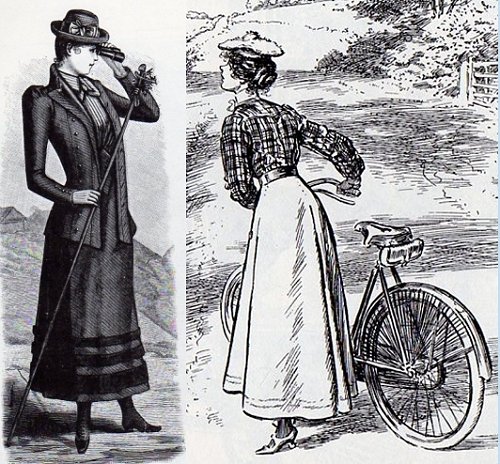 Shorter skirts were permissable for some sports: Left, mountaineering, 1891, and right, cycling, 1901. Both women have their hair up, signaling that they are adults. 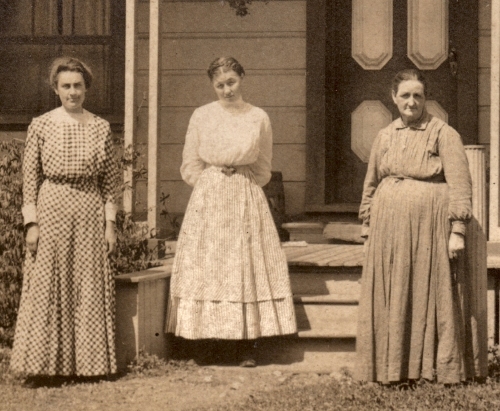 Three small town women, pre-WW I. 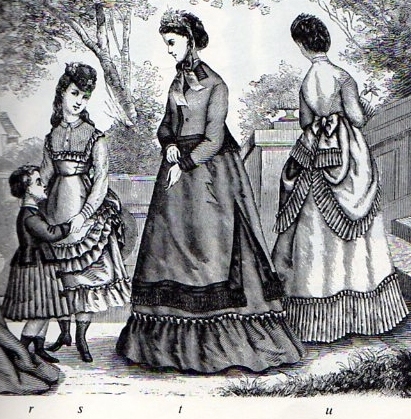 The young woman in the middle has her hair up, like an adult, but her skirt is much shorter than her mother’s (left.) She might be dressed for a walk; she may be a teenager, not an adult; or she may be a young adult anticipating the shorter skirts of 1915. The joke depends on the reader’s understanding the dress code. 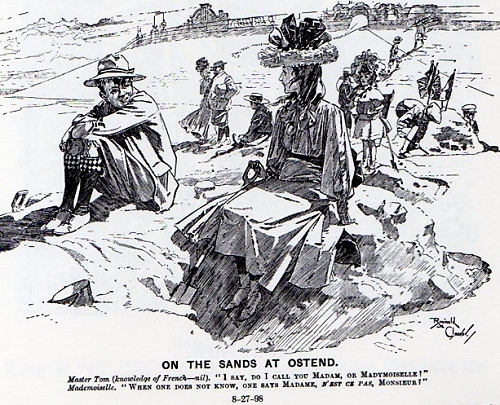 In 1898, readers would know from the girl’s loose hair and ankle-length skirt that she is definitely unmarried: a Mademoiselle. 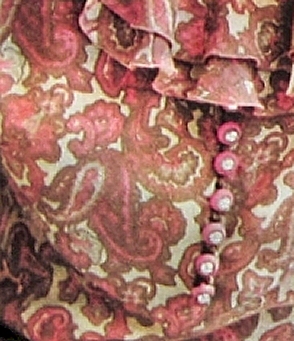 A pink paisley printed dress, from Elegance, Fall 1965-66. I was a sixties girl. 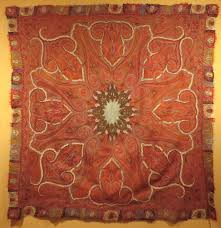 Paisley patterns were worn by hippies and Vogue readers alike. In the 1960s, Western manufacturers adapted the pattern into double-knits, like this jacket. . .
A paisley knit suit jacket, Elegance magazine, Fall 1965-66.
. . . and created subtler prints based on Indian designs, like this light pink wool. But I never made the connection between the pattern I called “paisley” and the Scottish cloth-manufacturing town of Paisley until this month. This was a good month for learning about paisley. 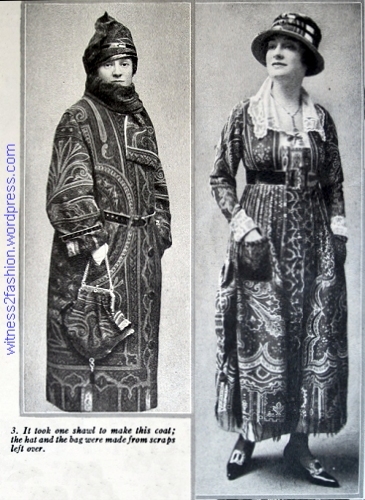 I had been reading a book about Jane Austen, which included an illustration of a “paisley” shawl; then I read a magazine from 1917 which showed examples of clothing made out of old paisley shawls. A coat, hat, & bag, made from one Victorian shawl, and a dress made from another old paisley shawl. Ladies’ Home Journal, Oct. 1917. To me, it seemed like sacrilege to chop a huge, [already] 60-year old wool or cashmere shawl . . .
A cashmere shaw, mid-1800s, from Wikipedia.
. . . into ugly 1917 clothing, but, of course, such fabric recycling is an old tradition. 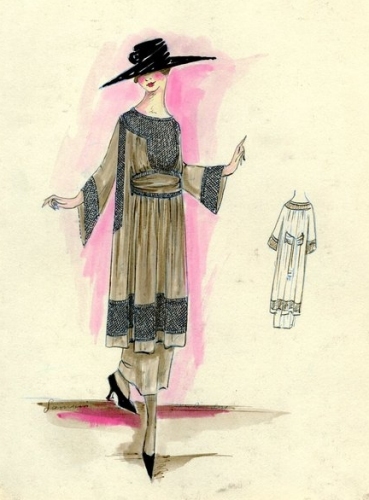 The Metropolitan Museum has examples of Victorian Paisley shawls converted into mid-Victorian bathrobes, and dolman jackets, 1920s coats, and rather chic 1920s suits. 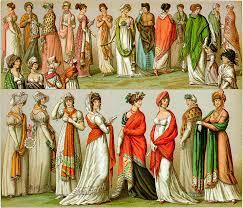 Rectangular Indian shawls were fashionable in the late 1700s and early 1800s. Image from Wikipedia. It took one shawl to make this coat, hat, & bag; a dress made from another Victorian Paisley shawl. Ladies’ Home Journal, Oct. 1917. But I give full marks for creativity to this handbag — made from a scrap of black velvet and a pair of old, long, white leather gloves with black stitching! 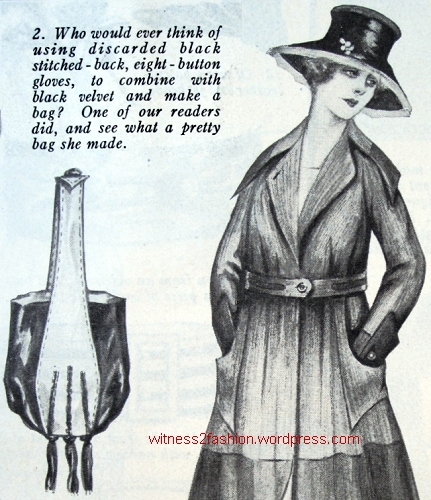 Handbag made from old gloves, Ladies’ Home Journal, Oct. 1917.